Ten Mormons in a Wine Cellar. Say hello to the Dentist and Attorneys of the class of 2008. We all went out to treat ourselves to fancy dinner before heading off to different corners of the Nation to become grownups. (snicker) Our reservation was at what I think is the most famous steakhouse in Indiana. Imagine our surprise when they led us down into the basement to our private table in the wine cellar. Folks, that right there is a bottle of hundred and five year old wine that is worth half a semester of Law School. Then I learned about the limited edition bottle of champagne that is promised to the owner of the Dallas Cowboys if it doesn’t sell by January 2009. It was only $8,000. And it came with a fancy box. That locked. I had prime rib. I had 32 oz. of prime rib. I ate 1/60th of my weight in cow. Does anybody know about the legend of the tomato juice? No? Well supposedly steak houses at the turn of the century would serve you a glass of tomato juice as an palate cleanser and to aid in digestion. 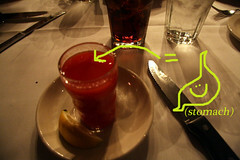 The tomato juice supposedly helps your body digest steak. Did I say supposedly? IT TOTALLY DOES. Someone my size who is used to eating string cheese and Cheetos should have been miserable after that much cow. But I felt just dandy. Even Cody, the self proclaimed meat eating champion of 2000 couldn’t even keep up with me. If I was anemic before Saturday night, I guarantee I’m not anymore. So that was our dinner. I’d be letting you down if I didn’t tell you what the server’s face looked like when he realized that the enormous table IN THE WINE CELLAR ordered nothing but water, Coke and lemonade. It was somewhere between a kid who got coal in his stocking on Christmas and someone who’d just been told his Pony Christol had died. How can I be first? I almost feel sorry for the dude. 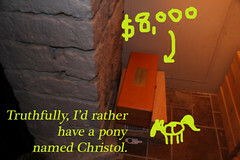 But I bet the pony cost way too much to room and board, so I’m sure he’s better off. Dude, we make jokes about how our firm’s life insurer would go out of business if our building spontaneously combusted. I’m trying not to think about the fact that a guy spend as much money on a bottle of Champagne as I would to pay off my car. And while the steak sounds lovely, I would much rather have one of your cakes. Haha… you ordered COKE? GASP. That is a major Mormon faux-pas ’round these parts. Back when I was still LDS I ordered a coke when I was out with some LDS friends and you should have SEEN the way the entire table stopped to glare at me! Hee hee… such a trouble maker I am, drinking COKE. Also? 8500$ for HALF a semester of law school? YEEPS. You should have come to Canada! 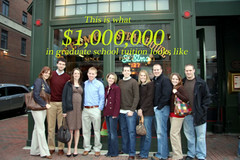 My husband’s tuition is only (yeah, ONLY… heh) $15,000/year. Not too shabby for tuition at one of the best law schools in Canadialand! Someone tried telling me that Mormons don’t eat chocolate. How hilarious is that? I directed them to the cake recipe on your blog. Misconceptions abound, this I know, but c’mon! Chocolate?? Sheesh. He was probably bummed because when people buy booze with dinner, they tip more both because they’re intoxicated and because booze is pricey, which drives up the bill. that is one honkin’ piece of meat! I have the occasional glass of wine or other drink, but boy I would NEVER EVER pay that much. Yikes! I would rather have a pony too. I should have read this post after dinner. I’m starving and the cow looked divine! Yum…I’ve always wanted to try St. Elmo’s! Somehow I had convinced myself that surely it’s not worth all that money, but now you have changed my tune. Table for two please! Oh that’s funny. If I had gone I’d have drunk the wine and you could have my cow. Holy cow. Ha. Steak, good! Oh who needs a pony when you can have steak! Kristin’s last blog post..Would you like some cheese with your whine ma’am? Yummy! Was it as good as Ruby River? I LOVE that place. Course the one we always went to is in Ogden, not even sure they have one down in your parts. So is THAT where the $600+ dinner bill came from? SWEET! Wow. That there is a honkin’ steak! Wow. Tomato juice, hmmmmmm. You have given me something to think about. 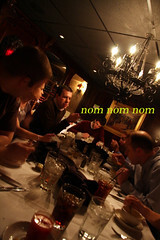 Nom nom nom nom nom nom…..
Ha ha I always figure waiters are disappointed when me and my Mormon friends all order water with lemon and/or raspberry lemonades. And a 32 oz steak???? I am so impressed. Now wait…You…YOU got a 32oz steak into that tiny body!! I am SO jealous! Sheesh. 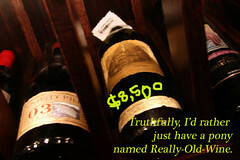 Poor waiter, was hoping you’d order an $8000 bottle of wine – makes for a nice tip. Plus, they don’t get to do the snooty waiter dance when you don’t order wine. Well, not the full, wine bearing snooty waiter dance. That steak looked gooood! Mandi’s last blog post..There’s a Bun in My…..Hard Drive?? Please tell me you tried the extremely overpriced, but world-famous Shrimp ****tail. That dish is spicy enough to really get your sweat on! We have had a $100 gift card to St. Elmo’s for over a year. That should cover part of dinner for two. I like the food there, but man is it spendy. BTW I am now twittered. we save so much money by staying sober lol! Poor waiter lol! I’d rather a pony named Christol also. lol Fun pictures and story. That meat looked delicious!! I had no idea about the tomato juice, good to know. Rhea’s last blog post..Would you like some ham with that scavenger hunt? I know how you feel. Try being a diabetic mormon lawyer wannabe on a boat in the Hudson River. The only thing onboard for you to drink is Diet Coke and the fat secretaries already took all three of them. Last winter we took our oldest son to Indianapolis for his first Colts game … and I had by far the most awesome dinner EVER at St. Elmo’s … and the highlight of the night was watching our then-9 year old inhale a shrimp that he slathered with their ****tail sauce! The dinner looks pretty tasty, I’ll have to remember the tip about the tomato juice too! Somehow something tells me this blog post title needs to be the title of a novel. I would think that if you went there, you could either eat OR drink at that price! 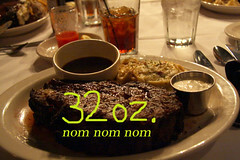 i am an experienced steak eater, but 32 oz? wow! one thing about the tomato juice: consuming vitamin c helps to aid iron absorption. megachick’s last blog post..is tooth loss contagious?